High Eye develops and builds a state-of-the-art UAV that is able to fly long range missions. Any payload up to 5.0 kg can be integrated on the UAV (ISA conditions, AMSL). High Eye has integrated multiple customer specific payloads like EO & IR gimbals, RF detection equipment, geographical survey sensors, gas detectors, spectrum analysers, magnetometers, data relay equipment and more. The HEF 32 is designed to carry a wide range of different payloads, that meet the requirements of its customers. The HEF 32 can support a custom payload up to 5kg. The RPAS can fly missions beyond visual line of sight (BVLOS) within a 50 km radius of the Ground Control Station. It can cover large distances over adverse terrain at cruising speeds up to 70 kts (130 km/h), by using advanced waypoint navigation or any other fully automatic flight modes. Missions in reduced line-of-sight conditions are possible through the MIMO capabilities (Multiple-Input Multiple-Output). The dual MIMO IP data-link is used for telemetry, flight control and payload. It is encrypted, fully redundant and acts as a self-healing mesh network. All power, payload, data and communication lines are protected against Electro-Magnetical Interference (EMI-shielded) and include several layers of EMI filtering. The HEF 32 is tested in a military EMI testing room and is fully compliant to MIL-STD-461F-RS103, meaning that it tolerates field strengths of at least 200 V/m over a very wide frequency range. It can be used safely in close proximity to sources of high power radiated energy, as can be found on naval vessels or airports. The HEF 32 is an all-weather long range VTOL UAV with industrial durability and aviation standards. The avionics, flight control systems and payload connection have specifically been designed to be resistant against natural elements and are protected against water and dust at a rating of IP67. The long range RPAS can be operated in strong winds, precipitation (rain/snow), high humidity, dust, cold and heat. The UAV has flown over tropical forests, mountainous areas, Arctic ice, Arabic deserts and European seas. Complicated governmental regulations and certification standards do not apply, due to the low weight of the UAV. The Maximum Take-Off Weight (MTOW) is 21.5 kg. The HEF 32 can be carried by 1 person and fits in a regular van or big car. The ground control station is a man-portable design, which allows mobility of the pilot during a mission. The HEF 32 can be carried by 1 person and fits in a regular van, pick-up or big car. The long range HEF 32 UAV will fly beyond 4 hours at cruising speed, with a modest payload and without refueling stops (ISA conditions, MSL). It can easily hover on station for more than 3 hours, maintaining its position without interruption. The HEF 32 VTOL UAV can replace a manned helicopter in many missions. 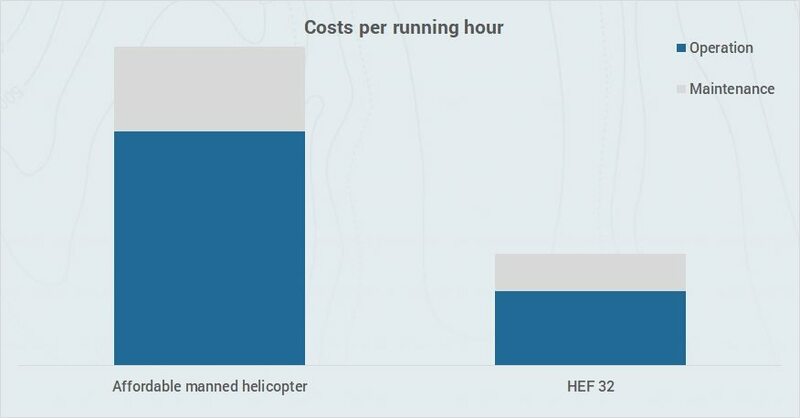 The operational cost of the HEF 32 is very low, when compared to an equivalent lightweight manned helicopter. To be able to replace current manned missions without compromising on operational flexibility, High Eye has focussed on the existing advantages that manned helicopter systems have: taking-off and landing anywhere and being able to hover and fly at low altitudes. The fuel driven piston engine of the HEF 32 UAV provides an optimal combination of weight, power and reliability. It provides continuous power for hours in a row without recharging or battery replacement. A short refueling stop is all that is needed to continue the mission.